Opened on Lower Campus in September 1975, the 790-bed Edmond’s Hall was built to help accommodate an undergraduate population that had swelled from 6,050 to 8,750 in nine years, largely due to the admittance of women to the College of Arts and Sciences in 1970 and the acquisition of Newton College in 1974. Originally named the Reservoir Apartments, or “Rezzies,” after the Chestnut Hill Reservoir it overlooked on St. Thomas More Drive, the residence was renamed in 1979 to honor admission dean Edmond Walsh, SJ, ’39, MA’40, who died that year. 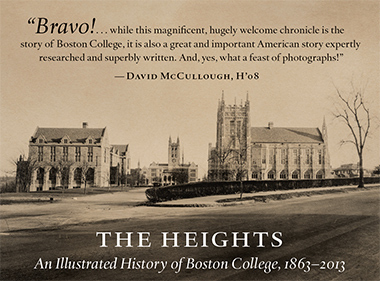 Whether it was the fact that Edmond’s was the only Boston College edifice (save Ignacio Hall) christened with a first name and not a family name, something about the nine-story, T-shaped building invited a breach of decorum. On the very first night of my freshman year, one of my floor-mates took me to his sophomore friend’s apartment on an upper floor. After introductions, the friend led us to the sink beside the bathroom and pulled aside a folded cardboard box beneath, revealing a man-sized hole he had already cut in the drywall. It was an escape tunnel through which he could crawl to his friends’ adjacent suite, should resident assistants knock on his door to break up a party. He’s now a VP at an investment bank. Some 30,000 students, Office of Residential Life staff, and campus ministers have called Edmond’s home, including former resident director Luis Inoa, MA’00, now an assistant dean and director of residential life at Vassar College. From 1998 to 2000, Inoa lived in a 760-square-foot, two-bedroom suite on the first floor with his wife, Evelyn, their two toddlers, and a newborn. “Sure, every time you look at the building you ask: What were they thinking?” says Inoa, perhaps referring to the four-foot tall “decorative” concrete parapet, or the rust-prone black-metal window trim. But he remembers a “strong sense of Edmond’s pride”—the painted window signs such as “G-O E-A-G-L-E-S” and “W-E A-R-E B-C” that spanned floors one to nine; the sophomore neighbors who babysat his children; and regularly cooking up pancakes and Bananas Foster for hundreds of students during midnight study breaks. “I only have positive memories,” he says. Michael Davidson, SJ, M.Ed.’11, a resident minister from 2011 until last May, hosted more than 30 students on the floor of his 250-square-foot living room in Edmond’s 822 every Sunday for his native Jamaican jerk chicken. He also cooked Thanksgiving dinner each year for some 60 students who couldn’t make it home, led the 16 resident advisors in Ignatian spiritual exercises each month, and offered his suite any time a resident’s visiting parents couldn’t afford a hotel. “Edmond’s is where my Jesuit life came to life,” says Davidson. Still, over time Edmond’s became the last resort of undergraduate men and women in the housing lottery. Seniors preferred the townhouses of Vouté and Gabelli or the Mods with their yards and barbecue grills; sophomores went for the spaciousness of Vanderslice and Walsh. Edmond’s also had only one study lounge. “To build community,” says housing director Greg Jones, the University has included common spaces on nearly every floor of every residence constructed since. • March 1983: An unidentified resident contracted the first reported case of measles in Massachusetts in more than two years, prompting an emergency vaccine clinic in Cushing Hall. • January 17, 1990: A few minutes after 2:00 a.m., a sophomore resident sat on the ledge of his window, lost his balance, and fell six stories. Odds of surviving a 60-foot drop, let alone avoiding paralysis, are about 40 percent. An iron fence broke the student’s descent nine feet above the ground. Though he fractured an arm, a leg, and his pelvis, he suffered no internal or head injuries. The English and theater major made a full recovery, graduated on time, and has since won three Daytime Emmy Awards writing for Sesame Street. Edmond’s was also the site of a dark moment in Boston College history. On Tuesday, September 20, 1988, at around 10:50 p.m., a culprit, never identified, launched a military-grade tear-gas canister in the second-floor hallway. The noxious, scorching fumes permeated the ventilation system and sent 800 students rushing out of the building; several jumped from second-floor windows. Thirty were hospitalized with nausea and burns to their eyes and noses. BCPD Officer Thomas Devlin, on the scene for hours assisting students, suffered burns over more than 65 percent of his lungs. He remained with the force for 16 years before he died from his injuries in 2007, at age 51. This fall, Fr. Davidson and some 490 students will move into 2150 Common-wealth Avenue, Boston College’s new dorm, a 245,000-square-foot, LEED-certified, granite-and-glass beauty. Though 21 residence halls on the Chestnut Hill and Newton campuses predate it, Edmond’s is the first Boston College dorm ever to come down. After the last foundation beams are hauled away in September, work will begin on a 240,000-square-foot recreation facility that will replace the 44-year-old RecPlex.